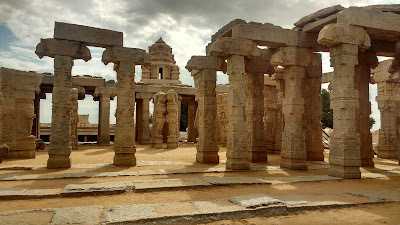 The village of Lepakshi is located at the south-western corner of Andhra Pradesh, at its border with Karnataka. 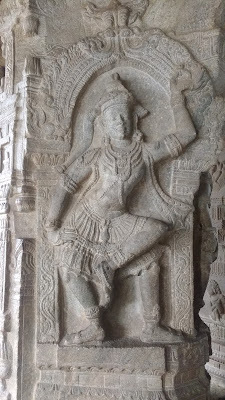 The otherwise nondescript village is now well known for the beautiful temple of Veerabhadra Swamy and its monolithic Nandi (bull; Basava locally). 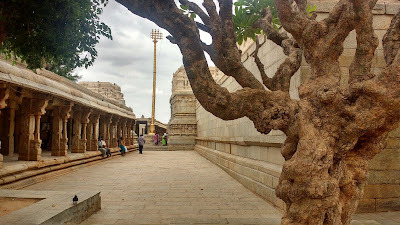 The temple belongs to the Vijayanagara school of architecture. The construction of the temple is attributed to Virupanna Nayaka and Viranna who were officers of King Achyutaraya of Penukonda. The construction is dated to the first half of the 16th century. 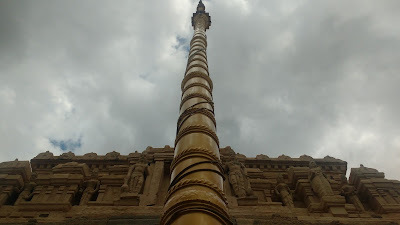 The Veerabhadra temple can be divided in to two sections - the outer enclave and the inner enclave. 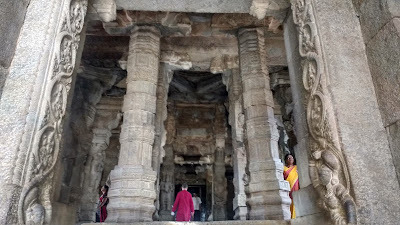 The inner enclave further has the main temple, the Nagalinga section and the western pillars. The temple complex has a double enclosure. The outer enclosure has a square plan with three gates - northern, eastern and western. The northern gate has a tower and is the main entry gate for the temple. The other two are closed. The northern gate of the outer enclosure opens to a gilded flagpost, followed by the northern entrance to the inner complex. The outer complex has open halls on all four sides. The temple has been build on a rounded and unflattened stone and the walls follow the topography. Consequently the southern side is at an elevation while the western side is depressed. 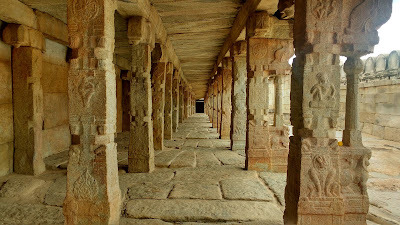 The halls feature the typical motifs of the Vijayanagara Cavalry on the pillars. Apart from the northern entrance, the inner complex also has an entrance from the south and the west. The southern entrance is simple. The western entrance is guarded by a Hanuman temple on the outer side. 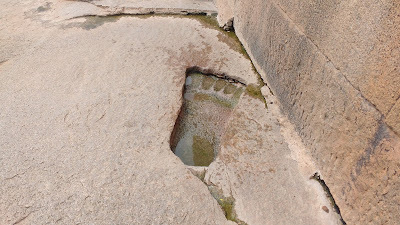 There's also a footprint engraved in the stone next to the gate. 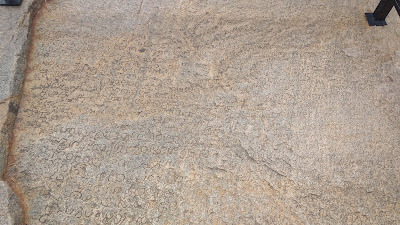 There is also an inscription detailing the construction of the temple on the western side. One enters the inner enclave from the entrance to the north. 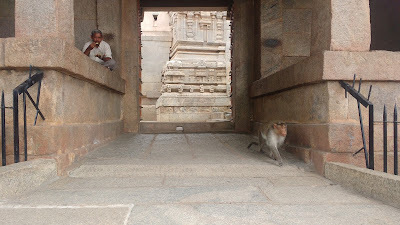 This entrance directly leads to the outer hall (natyamandapa) of the main temple. The outer hall has an octagonal space in the centre, set by eight exquisitely carved pillars. 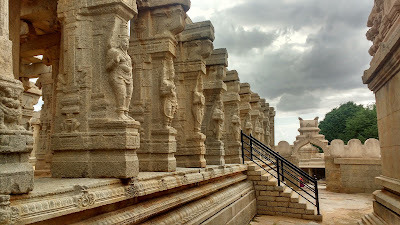 These pillars feature life size forms of deities indulging in dance and/or music. The outer pillars of this hall are comparatively modest. However, one pillar at the north-eastern side of the hall literally stands out - the floating pillar. Pass a string or a sheet of paper under the pillar and have fun verifying it. Seek the explanation locally - I'll not post the secret here. While you are at it with the pillars, take some time to glance up as well. 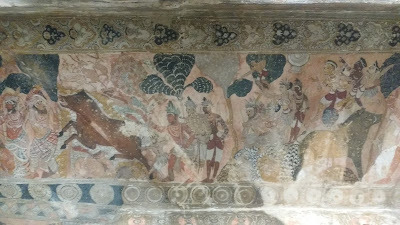 The ceiling of this hall features exquisite frescoes of the Vijayanagara style. Further in from the outer hall, is the inner hall (mukhamandapa), the main sanctum (garbhagriha) and the circumambulation (pradakshina) path . 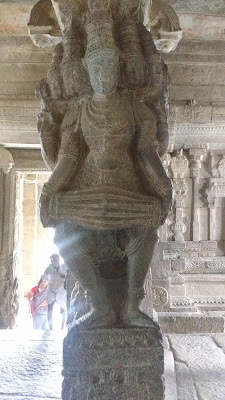 The inner hall itself has multiple shrines dedicated to Vishnu, Shiva (Papanatha), Parvati and Durga among others. This sections refers to a series of shrines carved out of two rectangular monoliths to the south of the main temple. 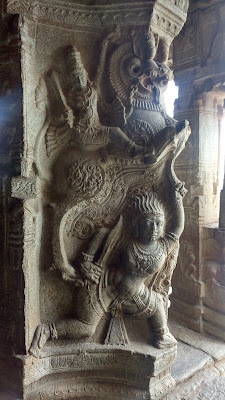 The eastern monolith features a beautiful depiction of the Nagalinga - a Shivling guarded by the open-hooded Naga (serpent). 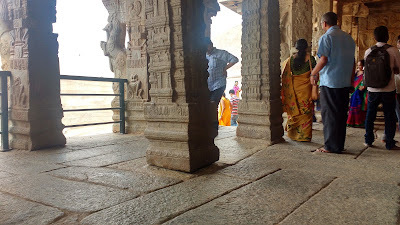 The hood faces the Nandi monolith at the edge of Lepakshi. The northern face of the monolith has a depiction of a king/priest and an elephant worshiping a Shivling. 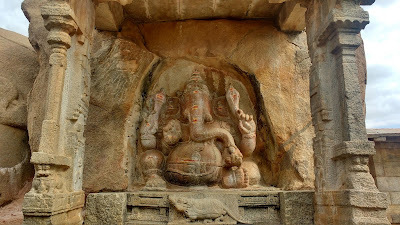 The western monolith has a larger-than-life depiction of Lord Ganesha. 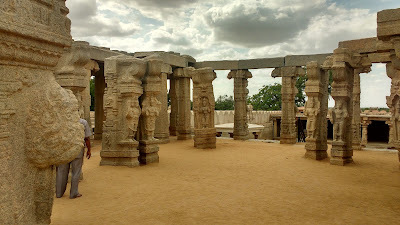 To the west of the Nagalinga section, one comes across an arrangement of highly ornate pillars which are most likely the ruins of another temple. This arrangement has a spire at the western side, while there's an open space like the outer hall of the main temple on the eastern side. The depictions are more formal in this section which makes me believe that the hall would have been used for meetings or debates. At the northern side of this section is a series of pillars depicting a sage (probably). 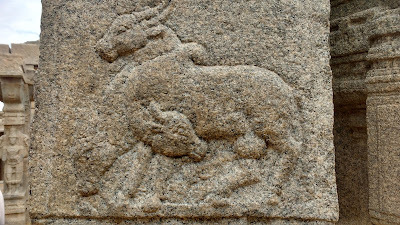 The Lepakshi Nandi sits by itself in a small, but maintained park at the eastern edge of the village. 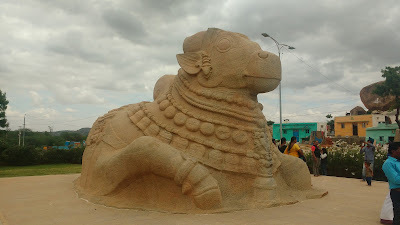 The Nandi is monolithic and well adorned. 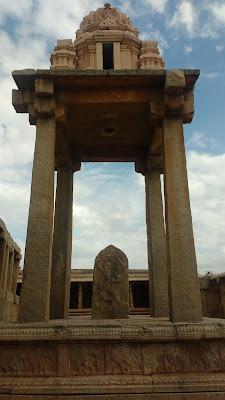 The Nandi faces west towards the Nagalinga sculpture adjacent to the main temple. Across the road from this park, one can see a hillock with minor temples. 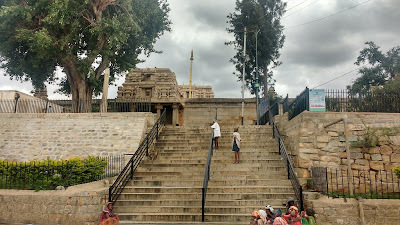 Access to these temples is tricky and is best left to the local kids. 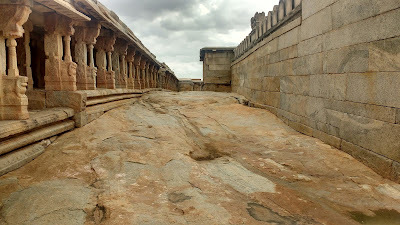 The primary access for Lepakshi is through the town of Hindupur. Frequent buses connect the two places. Rickshaws are also available. 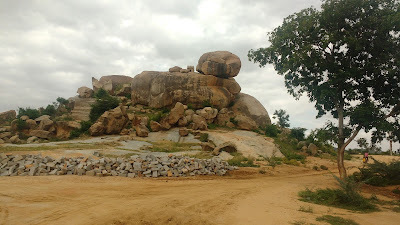 Hindupur is well connected to Bangalore and Anantapur by local buses. 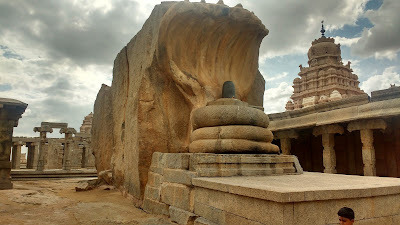 Lepakshi can also be directly approached from Bangalore-Hyderabad highway by taking a detour at Kodikonda. 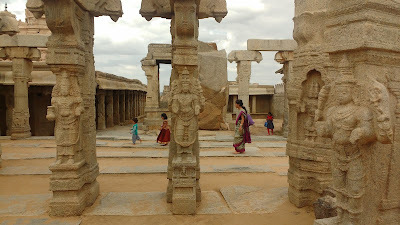 There's an APTDC Haritha complex between the Lepakshi Nandi and the bus stand which can be used for accommodation and food. There is also a paid toilet here.